One of the most controversial buildings in midtown and also one of the most successful midtown real estate ventures, 9 West 57th Street is largely responsible for the subsequent redevelopment of the Plaza District into the city's most prestigious office precinct. The General Motors Building (see The City Review article) had led the way, of course, when it was erected in 1968, but it merely ruined the elegant ambiance of Grand Army Plaza by razing the Savoy Plaza Hotel. This giant office tower, developed by Sheldon Solow, his first major commercial building venture, set new standards of elegance with the sleekest curtain wall facade in the city. Solow's tastes were refined enough for him to reject Gordon Bunshaft's first major design for the sloping tower and Bunshaft was astute enough to palm that design off on Swig, Weiler, Arnow who used it for their very similarly shaped tower at 1114 Avenue of the Americas, which was known originally as the W. R. Grace Building. Solow got the better building by far, although the primary difference is only the facade treatment. The north and south facades of the Solow tower project slightly from the building's edges and are extraordinarily sensuous because of the very fine detailing of the window gaskets. For those impressed with the slickness of the sloping facade, there are legions more, however, that were outraged at the building's "violation" of the traditional streetwall. Their quite valid argument was that the slope of the building exposed sides of adjacent buildings that were never meant to be exposed and therefore created gaping and horrendous scars in the cityscape. Of course, New York abounds in exposed sides of buildings that are very unattractive, but the critics of this building pointed out that its slope and its scale created a magnetic fascination that drew undue attention to the exposed sides of adjacent buildings, an accurate psychophysical observation. Bunshaft realized this effect and to counter it he designed the building's very large second-story gutter that curtains the potential visual avalanche from the unwary, or too wary, pedestrian. The building's outer columns, of course, protrude out from beneath the gutter at the same accelerating angle for the sake of both engineering and aesthetics. According to Bunshaft, the idea of the slope originated with trying to find different ways to comply with the city's complex setback and "sky exposure plane" zoning regulations that were planned to ensure adequate "light and air" reaching the street. The slope maximizes the buildable able that can be contained within a certain height by filling in some of the space that might otherwise be lost to setbacks. Of course, a slope design is more expensive to design and build and results in some lost interior space for tall people whose heads might bump into windows before their feet collided with the wall. On 57th Street, the building is set back a few feet from its building line and it also makes itself felt more intensely at street level by covering its sidewalks with the same travertine marble used on the facades and in the lobbies. Bunshaft, who also designed Lever House on Park Avenue, was not content that the gutter alone would alleviate pedestrian anxiety and he and Solow had the brainstorm to place a very large, bright red metal sculpture of the number "9" in front of the building. The sculpture is not quite effective as Isamu Noguchi's brilliant red cube in front of the Marine Midland Plaza tower at 120 Broadway, but it is nice, amusing and diverting. Bunshaft camouflaged the building's huge "mechanical" floor housing heating, ventilating and air-conditioning (HVAC) equipment at the building's fourth level by making it appear from the outside as two office floors. The building goes through its block to 58th Street where it faces the south side of the Plaza Hotel over which it looms. This side of 9 West 57th Street has a much larger plaza, decorated with a glorious, large Picasso sculpture of a mythic bull, than 57th Street, which is not as destructive as the sunken plaza of the General Motors Building across Fifth Avenue from the hotel, but which is certainly not a needed public amenity at this location. Had the full plaza been put on 57th Street and building moved flush to the 58th Street building line, it would have been a larger and possibly more useful public plaza, depending on its design and amenities, but it would also have created even larger, offending "scars." Many critics correctly observed that sloped or slanted buildings ideally should be freestanding or at least at corner sites rather than midblock. The country's best freestanding sloped skyscraper is the First National Bank Building in Chicago, built in 1969 and designed by C. f. Murphy Associates and the Perkins and Will Partnership. The Continental Illinois Center at 520 Madison Avenue between 53rd and 54th Streets has a partially slanted form and is not freestanding but occupies the full Madison Avenue blockfront. Completed in 1981, its design, by Der Scutt of Swanke Hayden Connell solved the swooping onrush pedestrian problem by truncating its slant above the street-level retail spaces. A quarter century after its completion, the streetscape of 57th Street has been utterly transformed from what had been a rather shabby genteel boulevard to an international showcase not only of fashion and art, but also corporate and architectural strength and 9 West 57th Street led the way in that renaissance and transformation. Sheldon Solow went on to build several other geometrically interesting and slick projects though none as visible and controversial as this. When A. T. & T. built its famous tower a few years later two blocks away on Madison Avenue, it impacted the street far more severely and ominously than this tower because virtually its entire bulk rose straight up from its building line on its rather small plot cutting off a whole lot of "light and air" without the reflective benefits of a mostly glass facade. Such are the vagaries of planning and development in Manhattan. 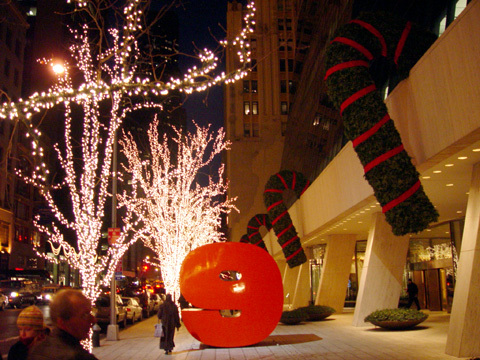 A tall Giacometti sculpture of man stands near the elevator bank facing 57th Street and during the Christmas holidays the travertine-clad lobbies are adorned with gilded garlands and the exterior gutters have hanging "candy-cane"-like wreaths hanging from them and the sidewalk trees are festooned with lights. In the late 1990s, however, it was removed and the south lobby remained art-less for almost two years until the Giacometti was replaced with a large, dark Henry Moore in September, 2000, about the same time as 8 1/2, a restaurant, finally opened in part of the building's large and long-vacant basement. 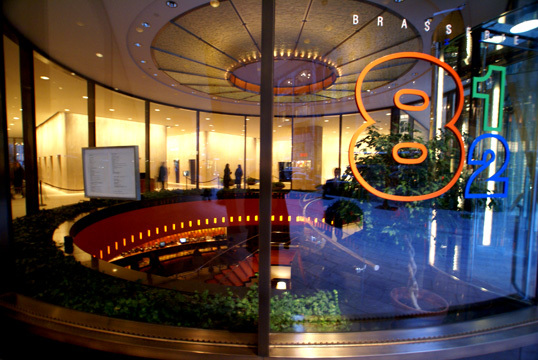 In 2000, new curved glass entrance to 8 1/2, a basement restaurant, replaced two escalators in the middle of building's 57th Street frontage. To accommodate the new restaurant, the two escalators in the middle of the south frontage were removed and a curved glass enclosure was installed, shown above, with a large curved staircase leading down to the large restaurant, which has a smoking-section bar and a non-smoking section bar, and a large stained-glass sculpture apparently modeled on a design by Fernand Léger.